After a moderately successful chase in the high plains on the 12th, another potential significant day followed. 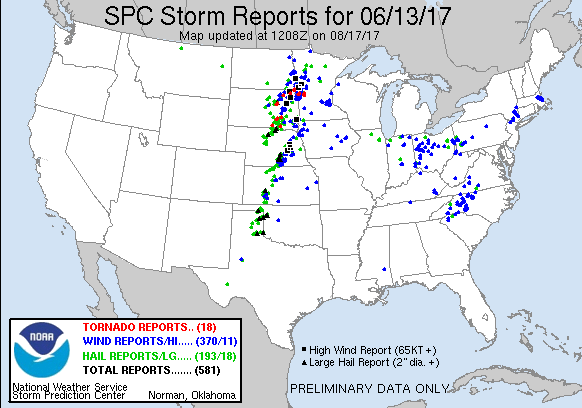 As a closed mid-level low rotated across Montana and Wyoming into the Northern Plains, a trough lagged behind that was forecast to move into the Dakotas during the evening on the 13th. At the surface, a low along the SD/NE border would drift east throughout the day while low 70 dewpoints advected into the warm sector in eastern South Dakota. SPC had outlined an enhanced risk along the triple point and a little bit along the warm front into extreme western Minnesota, with lower probabilities down the front and dryline all the way to the Texas Panhandle. I had spent the night in Chadron and given the morning surface analysis it looked like the triple point was the obvious play. However, some models were plotting some decent helicity tracks in the North Platte to O’Neill corridor which made the decision a bit tougher. Eventually, I decided to play the northern target and started the drive northeast. Unfortunately from Chadron there’s no direct route to Aberdeen so a trek through the eastern edge of the Black Hills was in order before hitting I-90. 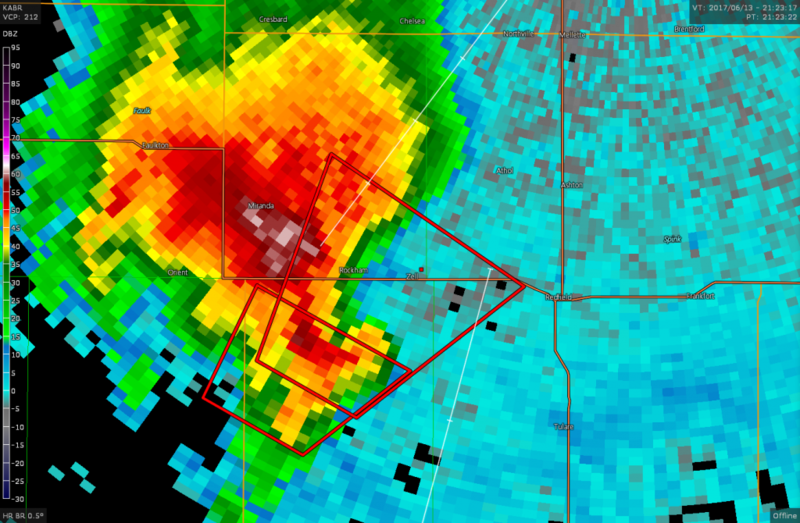 I left Chadron right around 13z and arrived in Pierre about four hours later. 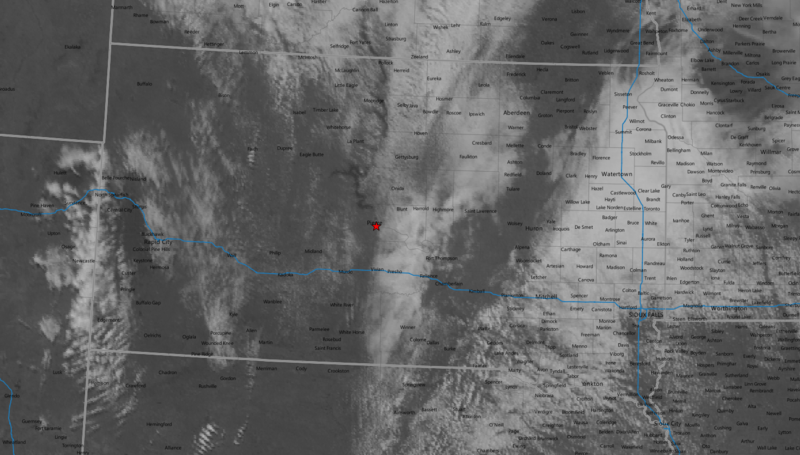 Visible satellite showed a clear slot in the clouds in eastern South Dakota with a line of cumulus forming west of it. 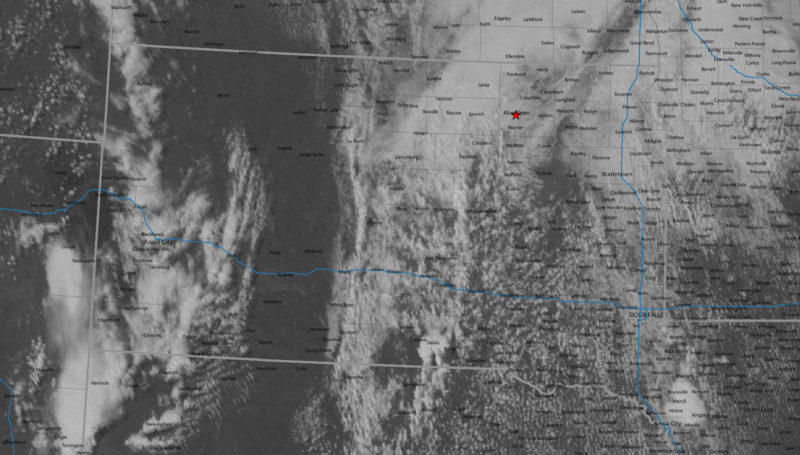 Satellite looked good while the surface analysis showed the low deepening and warm front lifting towards Aberdeen, so Aberdeen was the target and I continued north out of Pierre. The mesoscale discussion came out around 1930z indicating a tornado watch was likely as the surface low deepened to 999mb with mid 70°F dewpoints pushing into the area beneath backed surface winds. The watch was issued 45 minutes later just as I was pulling into Aberdeen. The cumulus field was looking more robust to my south and I was expecting explosive initiation. With northeast storm motions I decided to drift south as it appeared initiation was imminent in Hand County. 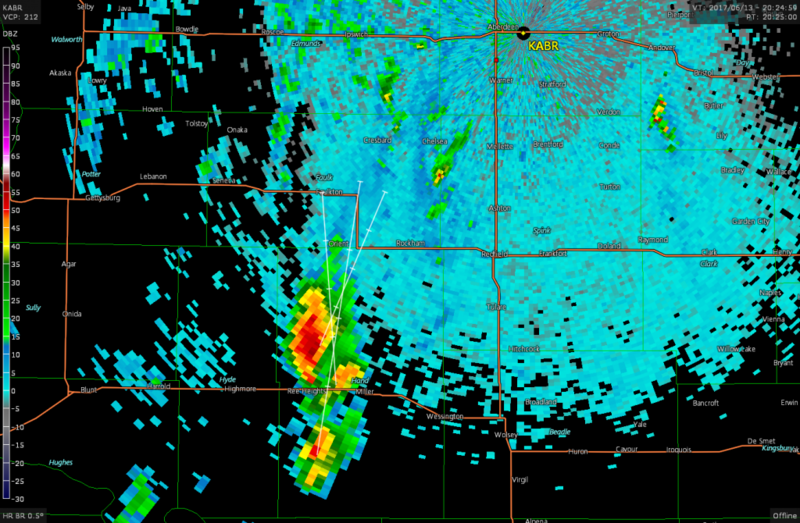 Sure enough a cell exploded near Miller and took about five scans to break the 50,000ft mark on the radar. That was the storm to go check out. I was already on the way south from Aberdeen and had about 30 minutes to intercept. About 30 minutes later I had a view of the base of the storm and it looked like it was a ground hugger with a very low forward flank shelf and rain enveloped updraft area making it difficult to spot anything in the area of interest. There was a tornado report that came in on Spotter Network during this time, but I was unable to see anything from my vantage point even though I was within 10 miles of the hook. After watching the storm approach my position, it became necessary to reposition. The plan was to hit US-212, go east and then north again at Redfield to keep up with the storm. Shortly after I turned east on the highway, the RFD cleared out and just to my south, not a quarter mile away, the storm put down a tornado for less than 30 seconds. I continued to track the storm northeast until dusk. While it didn’t put down any additional tornadoes while I was tracking it, it did present some cool looking aesthetics. 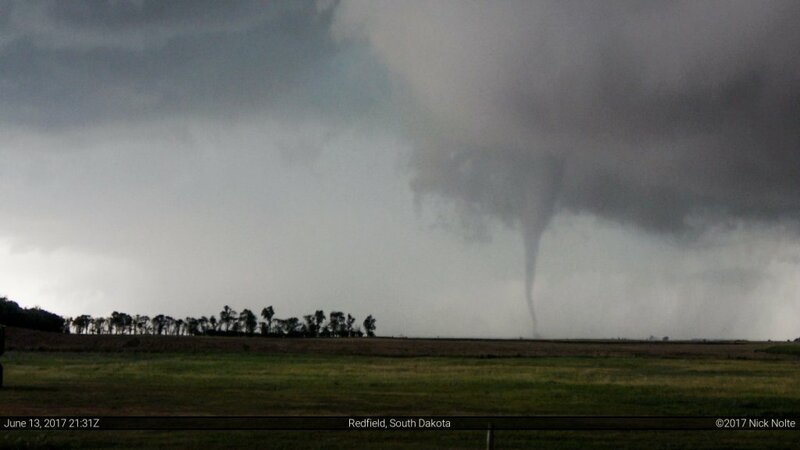 Shortly after this shot, I called it a chase and headed to Sioux Falls for the night.